Santa Monica Bar Association Summer BBQ — July 10th! – Web Presence Esq. Santa Monica Bar Association Summer BBQ — July 10th! WebPresence, Esq. 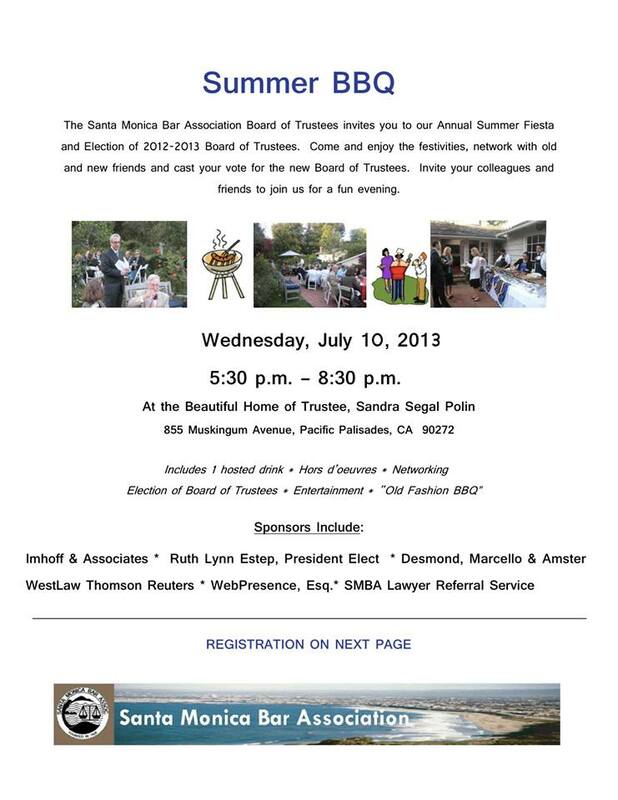 is pleased to be a sponsor of the Santa Monica Bar Association’s upcoming Summer BBQ! Join us on July 10th in the lovely Pacific Palisades as we enjoy some of summer’s most delicious food and drink and mingle with fellow So Cal attorneys and judiciary! WebPresence, Esq. believes firmly in the power of social networking for lawyers, and that means on and off-line (aka over the web and in person). Increase your referral network and expand your potential client base on July 10th as you mingle with new and old friends alike. We will also be voting for the new Board of Trustees, so be prepared! For more information on the event, see the flyer below or click this link to register directly. You can also contact WebPresence, Esq.’s founder, Kristen Marquis, an SMBA Board Member and Officer. PreviousPrevious post:Content Marketing is Key for Lawyers Looking to Their Optimize Online PresenceNextNext post:Is Your Law Firm’s Facebook Cover Photo Compliant?